Here are some of my favorite bay area bike shops of 2010. This isn't a comprehensive review of their quality of service. This is just a survey of all the shops that kept me coming back for more in 2010. There are so many great bike shops in the San Francisco Bay Area. In this post, I'm not even profiling some of the all-time greats. For instance, the Missing Link Cooperative. Its store and annex have been institutions in the east bay for years. Likewise, the chain store Mike's Bikes is great in many ways. It carries a nice range of Cannondales, Specialized, and other assorted bikes. Also, they have some great sales: where I got my last 3 bikes. Nevertheless, as great as these stores are, they leave room for lots of niches. These niches are filled nicely by the shops I'm about to feature. I love to just visit them every couple of months whether I need anything or not. The niches seems to fall into 2 categories: style and function. This is not to say any bike shop is lacking in either of these. However, when I think about what keeps me coming back to a given store it is one or the other these qualities. Regarding style, a relatively new shop is at the top of the list. That is Public Bikes. 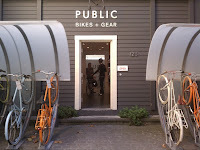 The Public Bike shop is actually a chain of stores selling Public Bikes. There are already 2 locations in San Francisco. The shops themselves are very unique and visually interesting. Outside of their surprisingly minimal South Park location, sit some of the tripy bike racks. I saw some similar in Palo Alto while researching bike parking and security. I haven't used one yet but they are pleasing to my eye. They turn bike racks from a cluttered pile of metal to something pretty. 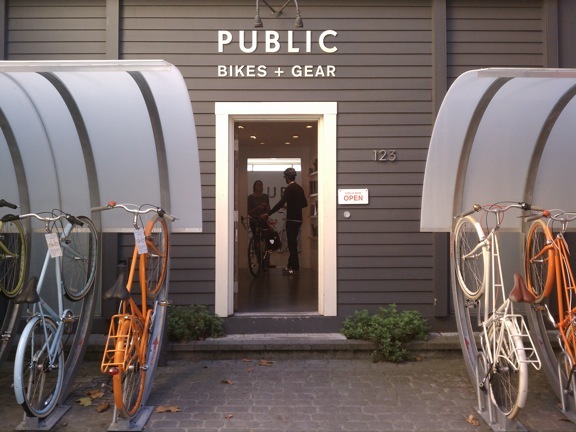 Regardless, they look way cool outside the Public Bike storefront. The second thing I like about Public Bikes is the hallway when you first enter. Instead of bike accessories, the walls are covered with books and magazines, some of which are not related to bicycles. This is far from the hard sell storefront. It feels more like a library. Once inside, you are treated to a sparse but elegant display of bikes and accessories. Some of the accessories are quite unique. For instance, they have bike helmets disguised as hats. The helmets have textiles wrapped around them to minimize that safety geek look that so many cyclists seem to hate. The final thing I like about Public is the Public Bike itself. At first glance, it looks like just another sturdy commuter bike: large seats, high handlebars, lots of fenders and racks. However, most intriguing to me is the internal shifting that many of these bikes feature. They use Shimano's Nexus internal shifting hub in 3 and 5 speed versions. These are not the lightest bikes but the elegant shifting is very cool. For style of a different sort, I like to visit Manifesto. It's centrally located in a flat part of Oakland so it is easy to get to by bike. It is also nicely situated next to a great espresso bar and a nice assortment of other interesting shops. Perhaps all this is why cyclists tend to congregate here. Manifesto has an eclectic mix of bikes: from cool commuter bikes (including internal shifting), to fixed gear, to regular road bikes. It also has a nice collection of accessories made out of recycled materials. It's fun to stop, grab some coffee, and have a look around. I just like the whole vibe there. 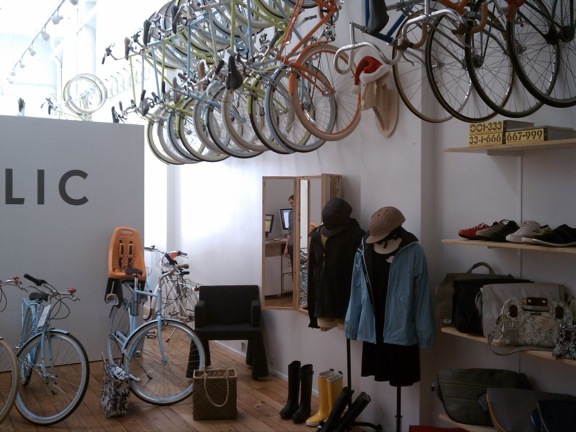 Finally, in the stylish category is Pacific Bicycles in San Francisco. The shop itself isn't particularly stylish but they carry some of the most stylish bikes. The Bianchi Pista is a classic fixed gear beauty and this shop has scads of 'em. Just seeing so many Pistas in one spot is a visual pleasure. Pacific Bicycles also carries scads of Cervélo road bikes. These are beautiful, mostly carbon fiber, bikes and they all look cool. I love their "squoval" and blade shaped frames and find their high contrast graphics and paint jobs to be a visual pleasure. Lifting the carbon ones is a pleasure as well. That sums up my top 3 bike shops for a stylish shopping experience. What follows are bike shops that are not the least bit lacking in style but have a wealth of functional aspects that have me frequently coming back for more. First up is Recycle Bicycle in Berkeley. The name says it all. The "pre-owned" nature of their bikes makes their bikes way affordable. Even so, this is no "land of misfit toys". They've got some cool bikes in here. Perhaps due to their focus on pre-owned bikes, they are also great at thinking creatively about all your existing bike issues. I came in asking what it would take to make an old 10 speed a fixie and they gave me a lot of details that saved me a lot of pain. Next up on the functional side is Tip Top Bike Shop. First of all, it has a great location. It is in the heart of a major cycling neighborhood in Oakland: The Temescal. This neighborhood is, in turn, situated on a major cycling corridor, Telegraph Avenue, which stretches between UC Berkeley and some hip parts of downtown Oakland. Perhaps its just me and where I bike but when I urgently need supplies or some work done, I consistently find Tip Top to be in the right place with the right stuff. The other day, they replaced my gear cassette while I hung out at a nearby café with my niece and nephew. I was going to schlep over to Mike's Bikes but Tip Top could do it when and where I was already going for pretty much the same price. Love that. Tip Top also has great gear I can't find anywhere else. In particular, they have Endura bike clothing. Endura is British rain/wind gear. Their jackets blow away anything else I've seen. Noone else in town seems to carry it so I love to swing by Tip Top to try on their latest. Finally, the guys at Tip Top are just very friendly and fun to talk to. I don't feel like they are selling the whole time. For function of a different sort, I like Bay Area Bikes. Although it also has a great location near downtown Oakland and a great bunch of guys doing sales and service, the thing about it that really stands out is its selection of folding bikes, particularly Dahon. Folding is a big deal. It dramatically expands where you can use a bike. You can fly with it and ride off from the airport. You can park it under your desk at work. Best of all, you can take it on the metro at rush hour. As of this writing many metro systems won't let you take your bike on the train during rush hour periods: the exact time when they should be helping people get out of their cars and on their bikes. Folding bikes are the exception. Hopefully, metros will fully recognize their symbiotic relationship with the bicycle and let them on their trains at all times of the day. Until then, folding bikes are a great solution. Folding bikes also have the advantage of providing all the fenders, racks, and high handlebars you find on any commuter bike but with a lot less weight. What's more, folding bikes are getting pretty stylish. Dahon's Speed Pro TT is pretty cool and fast looking. I saw one at Bay Area Bikes but it didn't stay there long. I want to take one for a spin if they get one in again. Last but not least, is Wheels of Justice. This place wins lots of points for both style and function. On the functional side, it's tough to find any bike shops up in the east bay hills except for Wheels of Justice. The hills are where both road and mountain bikers spend a lot of time so it is great not having to schlep all the way down the hill to get something. For parents, the place has one of the best selections I've seen of bikes for little kids. Nevertheless, it also has a great selection of supplies and unique accessories for all bikes. I found my Ergon pack at Wheels of Justice. I hadn't seen anything like it anywhere before nor have I since. These Ergon packs have straps that are mounted on a U-joint. The pack is also incredibly water-resistant. You can't dive with it but you can stand in the shower with it. Between that and the unique strap suspension system, no other bike pack comes close. When I needed to adjust the fit, Wheels of Justice was great about ordering parts and installing them at no charge. Although the cool products, location and customer service are great at Wheels of Justice, what I like best about this shop are the people who work there. It's their personal style that I find pleasing and useful. First of all, there's Justice Baxter, the owner, who is super cool. He's the kilted one on the left in the photo. I asked someone about the name and all I was told is "his parents were hippies". Fair enough. Anyway, Justice solicits more customer feedback than any shop owner I've seen. He's constantly using facebook to survey what his customers want most from his store. If that weren't enough, the store regularly hosts "customer appreciation parties", group rides, and bicycle lessons of all types. Sometimes, it feels more like a club and than a store. That is my favorite kind of bike shop. Very interesting post. After reading your article i am also thinking to buy a cycle for myself. They are really fun. I hope you do. Thanks for reading. I have a lot of Detours bags that I've featured on this blog and this is another winner. I'm also wearing the Bikie Girl Bloomer Trio, which I product tested for another upcoming review on Commute by Bike. That's about as far as I take multi-tasking. Thank you posting these great bike shops to get my new bike from. Thank you so much for sharing your story and tips . They can be helpful to those who are looking for good bike deals. A wonderful post and effective one. Awesome blog sharing. Informative article and useful for everyone. Plan bikes is a great bikes shop. This bicycle is excited for everyone. Lovely bikes shop. This is very informative share about bike. I have been looking for a good bike and this post is going to help me. Thanks for sharing.